Great! Google: keep doing things like this! Wonderful.. 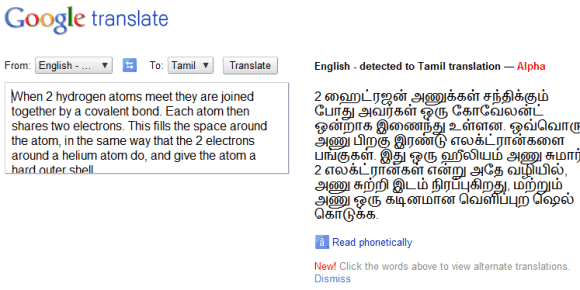 I was waiting for years for this kind of service in Tamil. Although the grammar and vocabulary is little incorrect, we can forgive it as those languages are still in alpha..
Well i was happy to see telugu is in the list of translation languages. But my joy was for only few mins. Not only Punjabi, Marathi is missing..
it would be even better to also put voice on the rest of the languages that are already listed, a not a mono tone microsoft voice but a real one like the other ones.